It’s Father Dave, back from my Monday night run and keen to share my week with you. I ran alone again, which was a shame as the Cook’s river looked beautiful tonight, if a little eerie. Everything was bathed in a cold winter moonlight, and I hardly saw another soul out there! It left me feeling very peaceful and thankful, and this despite the fact that it started raining when I was still about 5kms from home. One of the reasons I enjoy my weekly half-marathon so much is because I listen to books on my MP3 player as I run. This week I heard two lectures by Richard Rohr on “Great Themes of St Paul” where Father Richard was focusing on one of St Paul’s great insights – that God doesn’t reward us with love and forgiveness once we’ve achieved a level of moral or religious perfection. Rather, God simply loves and forgives us, despite all our imperfections, and this is what empowers us to achieve whatever we are capable of achieving. Great stuff! As I look back, my week has really been defined by three gatherings that each expressed unity with diversity. The first was an all-day conference for Martial Arts instructors that I attended on Saturday. It was hosted by the Australian College of Sports Development and brought together martial arts instructors of all kinds from across Sydney and across the country, though I think that Mungo, Caine and I (the three Fighting Fathers) were the only boxing trainers. The conference was well organised and well-presented, though I must confess that it left me feeling very thankful that I had ditched the ‘sensei’ persona years ago in favour of being a simple ‘trainer’. The distinction is chalk and cheese! The ‘sensei’ figure stands up the front as the dispenser of all knowledge, while the students bow and scrape before him, ever respectful of sensei’s superior wisdom and power. Of course I’m not suggesting that anybody at the conference behaves that way, but the role is custom-made for people with ego problems. Mind you, there are plenty of clergy who run their churches that way too. Enough said! The second event was a glorious ‘International Brunch’ we put on at church on Sunday, where everybody was encouraged to bring a dish from their own country of origin. The diversity of the cuisine was wonderful, but even more so the diversity of the people who were there! 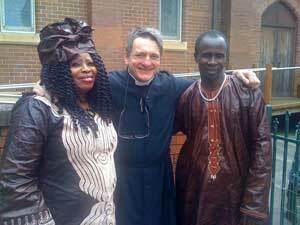 The immediate excuse for the party was the reunion of one of our Sierra Leonean families. Ramatu had been trying for years to bring her husband and two daughters out to Australia to join her, and now they are here! The third event was an Inter-faith dinner that I attended last night at the Nabi Akram Islamic Centre in Granville. It was a fantastic event that that brought together people from across the religious spectrum – Christians, Muslims, Jews, Hindus, Buddhists, and Indigenous religious leaders. I was particularly impressed with Sheikh Zaid Alsalami, who organised the event, and with Rabbi Zalman Kastel, who represented a group called “Together for Humanity” (of which I believe he was the founder). Here’s a snap-shot of the panel discussion that took place towards the end of the evening (click it to enlarge). I’m sitting between the Indigenous Australian representative on my left and a lovely young Sunni Muslim man from Liberia on my right. I was deeply impressed by the respect that everybody there showed to each other, and by the articulate and well-reasoned nature of the speeches that were given. Indeed, the only statement I took real exception to on the night came from the other Christian representative! I won’t mention his name, and I’m sure he’s a better Christian than me in almost every way, but when he was asked whether Christians believed that God will forgive us our sins even when these sins are committed AFTER we have turned to God, he replied “we can’t be sure but we can hope! I thought he’d been given a golden opportunity to share the distinctively Christian proclamation of universal and everlasting forgiveness, and he blew it! I’ll think I’m going to have to send him those lectures by Richard Rohr! Before I let you go tonight I must apologise if you’ve been having trouble with www.how2changetheworld.com. We seem to be under some sort of attack that is chewing up all the bandwidth and making it impossible to access the site. Hopefully we’ll have it fixed by later today. If you’ve been trying to join our wonderful contest at http://how2changetheworld.com/contest/ please try again. OK. That’s plenty from me tonight. This entry was posted in Monday Missive and tagged Diverse Arts, Diverse Faiths, Diverse Foods, St Paul by Father Dave. Bookmark the permalink.